When lost in thought about Goa, the endless beaches, the vibe and most importantly the great seafood and coastal cuisine comes to mind. Goa has been taken over by restaurants and cafes serving such varied dishes from around the world. This so happened to make the traditional cuisine of theirs become relegated to the homes. I mean other than the Cafreal, Vindaloo and Xacuti, it is only now that the other superbly prepared Goan dishes are gaining ground. This is exactly what excited me about the Goan Food Festival at the Park Hyatt. The food festival helmed by Chef Tanuja from Casa Sarita, Park Hyatt Goa was showcasing the Portuguese influence on Goan food. Now a point that I wanted to iterate is about the way the menu was set-up. Starting off with the regular flavors you’d expect about Goa was the Chicken Jire Mire, a burst of coarsely ground spices of cumin and black pepper. Alongside was the Goan Masala Fried Fish, with the tartness of Goan vinegar, Fenugreek Vegetable Cutlets and Mushroom stuffed with vegetables, cheese and homemade spices. These are the kind of perfect combinations you’d expect to give you company on the sandy beaches alongside a glass of Feni and Limca. But it was the Soups and Salads that caught me by surprise. 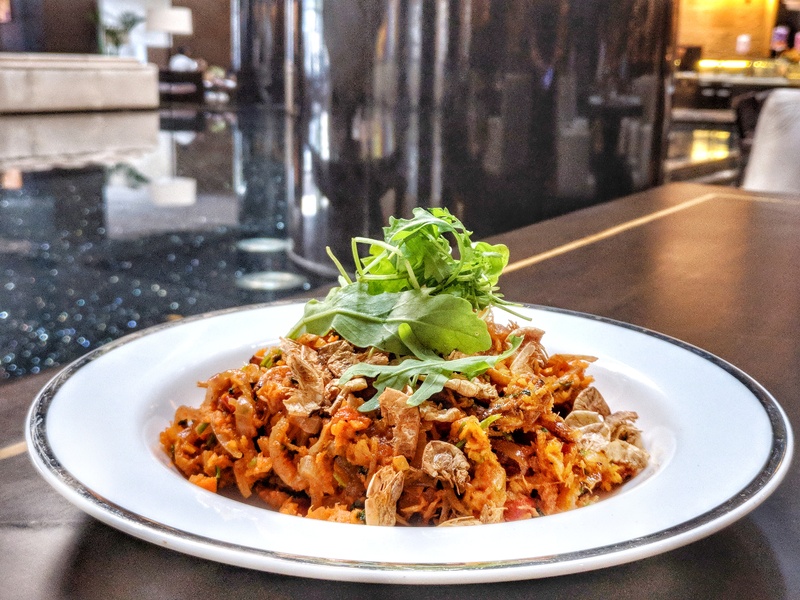 The Kismur, a salad like preparation using dried fish with bell peppers, tomato and coriander was exquisitely wonderful with an eclectic mix of coconut. This might be a little off-putting for a person who’s having dried prawns for the first time but not for my East Indian palate. This is something that we too grew up with and I could relate to the similarities between the two extreme corners of the country. The Cabbage Salad was refreshing while the Caldo Verde Soup was the right showcase of Portuguese influences on Goan food. The Potato and Spinach soup is popular in European cuisines and had slowly seeped into the local food under the Portuguese rule. Time for the Main Course and out came the most famous dishes which reverberate Goa. The Goan Prawns Curry with simple rice was relaxing to have and so was the Mushroom Xacuti. I did miss the Poi which had been replaced with Pav over here. After the biggest influence the Portuguese have got into India is the culture of Bread. But the favorite during my meal at the Park Hyatt was the Pork Vindaloo. Not overtly vinegary or spicy, the right mix of fat and meat which turned out to be absolutely brilliant.